After Metallica built up a groundswell of fandom throughout the heavy metal scene in the '80s, vocalist/guitarist James Hetfield, lead guitarist Kirk Hammett, bassist Jason Newsted, and drummer Lars Ulrich were put through the wringer with The Cult and Mötley Crüe producer Bob Rock (real name) and their inner demons at the beginning of the new decade. The band worked for almost a year to come up with new approaches to songwriting and musicianship, culminating in their self-titled fifth album—commonly referred to as The Black Album—which was finally released on August 12, 1991. It entered the Billboard charts at number one and ended up selling more than 16 million copies. Here are some facts about the classic record to read wherever you may roam. 1. THE SONGS AREN'T AS LONG AS IN ...AND JUSTICE FOR ALL (1988) BECAUSE OF THEIR AUDIENCES' FACES. When they toured their previous album before The Black Album, Hammett and the band couldn't help but look at the crowd while they were busy jamming during the 9 minute and 46 second long title track. "Everyone would have these long faces," Hammett recalled. "And I'd think, 'Goddamn, they're not enjoying it as much as we are. If it wasn't for the big bang at the end of the song...'" Hetfield agreed, adding that they had done the longer song format "to death." 2. IT TOOK 10 MONTHS AND $1 MILLION TO MAKE. Recording began on October 6, 1990 at One on One Recording Studios in North Hollywood, California. The album was remixed three times. It took so long despite the fact that Rock admitted to tricking the band into getting them to play stuff quickly and say, "'We'll come back to it later.' But we hardly ever went back." 3. THREE OF THE BAND MEMBERS WERE GOING THROUGH DIVORCES. "Lars [Ulrich], Jason [Newsted] and I were going through divorces," said Hammett. "I was an emotional wreck. I was trying to take those feelingS of guilt and failure and channel them into the music, to get something positive out of it. Jason and Lars were too, and I think that has a lot to do with why the Black Album sounds the way it does." 4. JAMES HETFIELD AND PRODUCER BOB ROCK CLASHED OFTEN. "I used to call James Dr. No," Bob Rock remembered for Rolling Stone. "Whenever I was about to make a suggestion that seemed even a little off the wall, he'd say no before I'd even finished the first sentence." Hetfield would give in over some ideas eventually, but that wasn't enough for Rock. “Sure, we had some laughs, but things were difficult. I told the guys when we were done that I’d never work with them again. They felt the same way about me.” He also called the album "the biggest accomplishment" of his professional life, and produced Metallica's next three albums. 5. THEY FOCUSED MORE ON LARS' DRUMMING THAN HETFIELD'S GUITAR PLAYING, AS ROCK MESSED WITH ALL OF THEIR APPROACHES. He also instructed Newsted to play more like a bass player and less like a guitarist. Also, Rock made Metallica play live together in the studio, after spending the '80s recording in sessions. Hammett was no longer allowed to record his solos during the final few weeks of recording. Instead he uncomfortably learned to play and figure out the solos live with everybody else. Hammett remembered getting a little embarrassed. "On one song, I played the solo and went, 'Hello!' and Bob just looked at me and said, 'Man, you're not even playing with the band.'" Their new producer suggested he play more bluesy, sustained notes, which shocked Hammett, because "for once" he was right. 6. MOTLEY CRUE HELPED INTRODUCE METALLICA TO A LOWER TUNING THAT THE BAND NEVER KNEW ABOUT. Acknowledging that he had only yelled and never sang, Hetfield played Rock Isaak's "Wicked Game" and asked him how he can sing like that for "Nothing Else Matters" and "The Unforgiven." Rock said, “I’ll get you a great vocal sound, so you don’t have to double your vocals. What you hear in Chris Isaak’s voice is the nuances when he sings—he isn’t doubled. He’s actually performing. You perform." Hetfield sang every day and gradually got better and more comfortable. 8. 'NOTHING ELSE MATTERS' WAS PERSONAL FOR HETFIELD. "That song was just me and my guitar on the road," Hetfield said. "It came together somewhere in Canada, I think. I just sat in my room working on this thing. It was a personal thing. I played it for myself. But I played it for Lars, and he listened and said, 'Man, that's pretty cool.' And I thought, 'Yeah, it is.'" Hammett had a different reaction. "All I could think of at the time was, James wrote a f**king love song to his girlfriend? That's just weird." Rock thought that "Nothing Else Matters" was "all about him trying to write a love song without saying the word ‘love.’"
9. 'ENTER SANDMAN' BORROWED A RIFF FROM HEART. "I think the time has come to reveal where I actually got the guitar lick before the breakdown in 'Enter Sandman,'" Hammett teased to Guitar World. "It’s from 'Magic Man,' by Heart, but I didn’t get it from Heart’s version; I got it from a cut off Ice-T’s Power album ['Personal'], where he sampled it. I heard that and thought, I have to snake this!" 10. THEY HAD THEIR LISTENING PARTY AT MADISON SQUARE GARDEN. The band gave away 19,000 tickets for a huge listening party of The Black Album at MSG. It took place on August 3, 1991. Ulrich noted, "The really annoying thing is our album played the Garden before we did." 11. LARS ULRICH WAS UNIMPRESSED WHEN THEY DEBUTED AT NUMBER ONE. The drummer was in a hotel room in Budapest, Hungary when a fax came in from the band's management office. 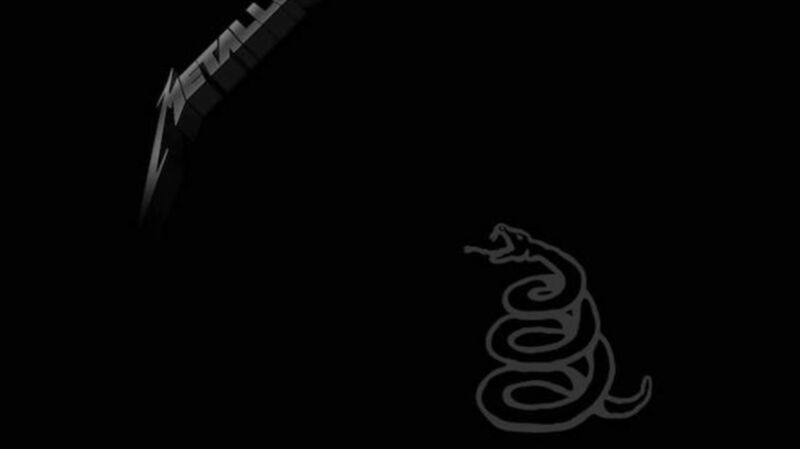 The Black Album was the number one album in the United States. "You think one day some f**ker's gonna tell you, 'You have a Number One record in America,' and the whole world will ejaculate," Ulrich told Rolling Stone. "I stood there in my hotel room, and there was this fax that said, 'You're Number One.' And it was, like, 'Well, okay.' It was just another f**king fax from the office."